Titled Feels So Right Now, the exhibition runs in their Basel space from 12 June – 21 July 2018. Metz’s practice revolves around the activity of painting, yet also incorporates sculpture, installation, sound and performance. His works explore the inherent properties of materials, creating organic, flowing shapes which shift emphasis from a specific gesture towards an overall experience of form, colour and hue. The exhibition at von Bartha expands on the artist’s exploration of the relationship between image and object. In the gallery’s entrance, Metz’s shapes translate into a floor sculpture consisting of three parts. Redirecting the visitors’ way through the gallery space, the pieces invite the viewer to interact with their freestanding forms, navigating around and between them. At first glance, the end gallery appears vacant. 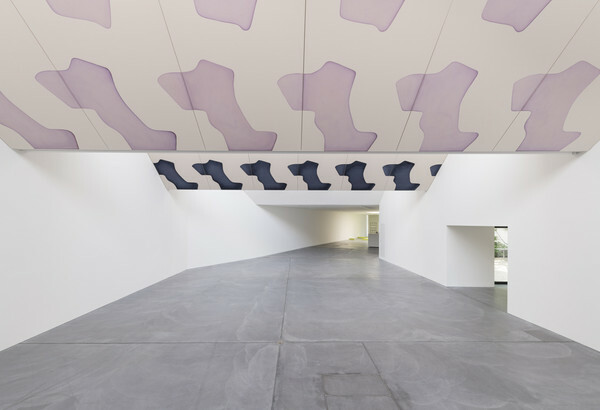 However, moving through the space, the viewer encounters two series’ of Metz’s dye paintings spanning the sloped ceiling. Using dye on unprimed canvas, the pigment merges with the fibres of the plane, producing morphic forms according to the perimeters set by the artist. Shifting the viewer’s gaze upwards, these site-conscious works interact with the physicality of the gallery space; visitor and architecture become equally important components within the exhibition. The show also includes the artist’s first sound work. Transforming the gallery into a performative environment, the work creates a solemn and meditative atmosphere. Relating to the core elements of Metz’s practice, it is based on repetitions and infinity, whilst further acknowledging the viewer’s presence as an integral part of the work.